Senator Iyiola Omisore, the Social Democratic Party Candidate in the Osun state governorship election has agreed to support the All progressive candidate, Gboyega Oyetola in the rerun governorship election. 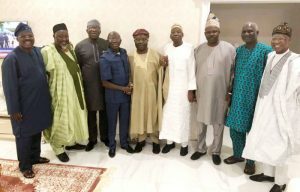 According to reports Omisore met a powerful delegation of the APC, led by the national chairman, Adams Oshiomhole, four governors- Badaru, Ganduje, Amosun and Ajimobi and Ekiti-governor elect, Kayode Fayemi. The Minister of Information and Culture was also in the delegation.